Properly placing the front speakers in your home theater is key to creating the desired sound effects. The front speakers — left, right, and center — provide the bulk of the sound you listen to while watching programs or movies. One of the key jobs of these front speakers is to provide a realistic reproduction of dialogue — you want people in the middle of the display to sound like they’re right in front of you, and those on the left and right to sound like that’s where they are. Well-placed front speakers minimize any gaps in the speakers’ coverage (so when dialogue moves from side to side, it does so seamlessly). Carefully place your left, center, and right front speakers for optimal sound. Set up your center channel speaker first. The placement of the left and right front speakers depends on the position of your center speaker. Make sure the front surface of the center channel speaker is flush with the TV display. Most center channel speakers are designed to be placed directly on top of the display. Keep the front surfaces of both flush with each other to minimize reflections. If you have a wall-mounted display (like a flat-panel plasma or LCD TV), you might have a hard time getting your center channel speaker flush with the display (unless you’re using wall-mounted speakers especially designed for such applications). Just try to keep the front of your center channel relatively close to the same vertical plane as the front of your display — don’t stick it too far out in front if you can avoid it. Keep the right and left channel speakers the same distance from your listening position as the front speaker. 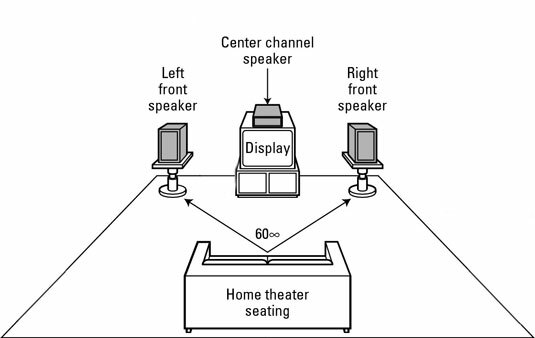 Instead of a line, the front speakers should form an arc in front of you, in which each speaker is the same distance from your primary viewing position (or the middle of the viewing position, such as the center of a couch or the middle of a group of seats). If you’re using wall-mount speakers with a wall-mounted flat panel, you’re not going to be able to do this. It’s not a huge deal as long as you take the time to “teach” your receiver where your speakers are when you configure it. Because these speakers will be a bit farther away from you than the center channel when you’re sitting directly in front of the display, you’ll simply have the receiver introduce a bit of delay in the signals sent to these speakers, so the sound arrives at your ears at the right time. Toe-in the left and right speakers. The front panels of the left and right speakers should be placed so that they are aimed directly at (or immediately behind) your seating position. Many wall mounts allow you to angle the speakers this way. Some speakers are designed such that their front panels are already toed-in when the speakers are placed parallel to the wall. Check the manual that comes with your speakers to see if there are any recommendations on toe-in. Place the left and right speakers at a 45- to 60-degree angle from the listening position. Start off with the speakers at the wider angle. Place each speaker 30 degrees to the right or left of the center speaker from your viewing position. If you find, while listening to movie soundtracks, that sounds seem unnatural and too widely spaced, you can move the right and left speakers closer to the screen. Conversely, if it’s hard to distinguish right from left from most seating positions, spread the speakers a bit farther apart. Place the speakers’ tweeters at or near the viewers’ ear level. Keep in mind the seated height of your viewers in the seating you’ve selected and adjust your speakers accordingly when selecting stands or wall mounting. Even if you have floor-standing speakers, you can buy small stands to raise the height, if necessary. If your center speaker is above you, you can at least aim it down toward your listening position.